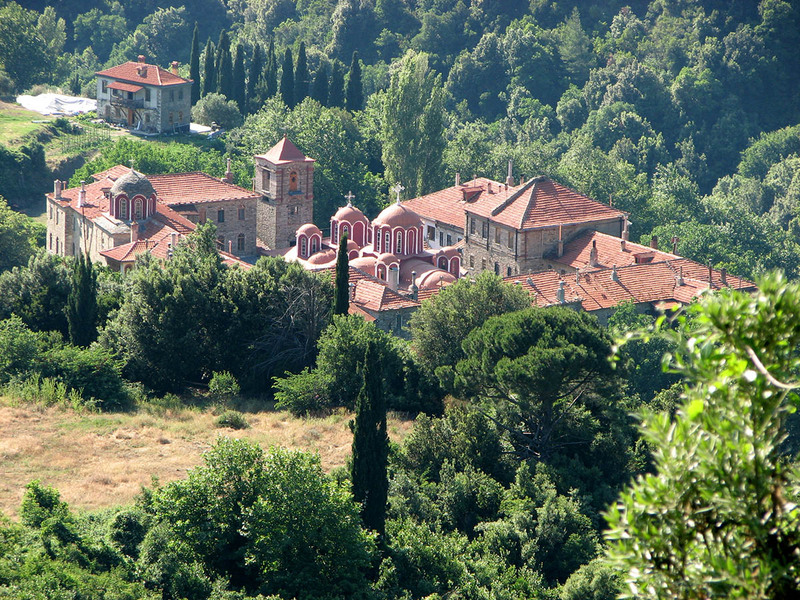 The Monastery of Kastamonitou celebrates on the day of Martyr Stefanos on the 27th of December. 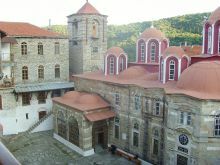 For the establishment of the monastery there is no confirmed testimony since all the relevant documents have been destroyed. 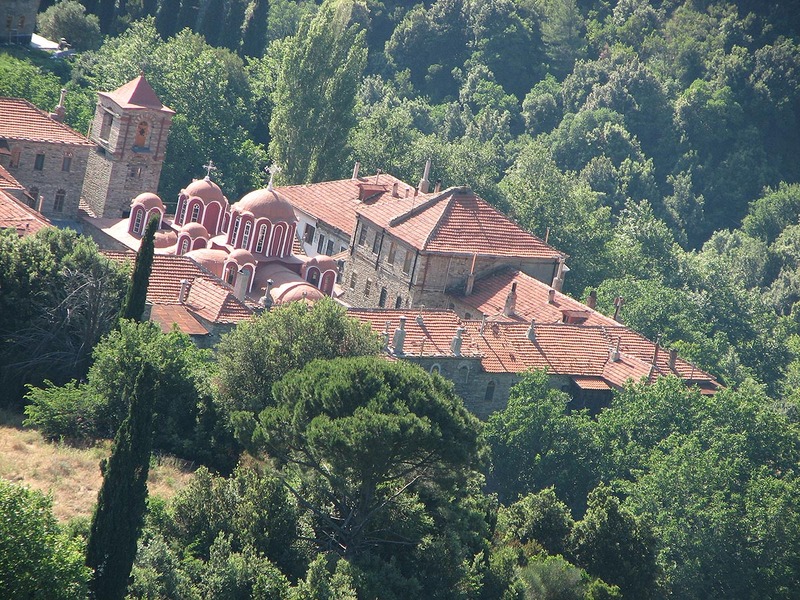 However in a document of the 11th century Ilarion Kastamonitis is referred to as the owner. The Monastery is located close to the Monastery of Zografou in a 50' distance from the coast, in an altitude of 200 meters. According to the stories of its founding these are the different versions, the first talks about the erection of a temple by Emperor Constantinos the Great and his son Constantios in the 4th century. Other sources link its establishment with a monk from Kastamoni of Asia Minor, who was said to have built the monastery at the location where perhaps was the ancient town Thyssos. 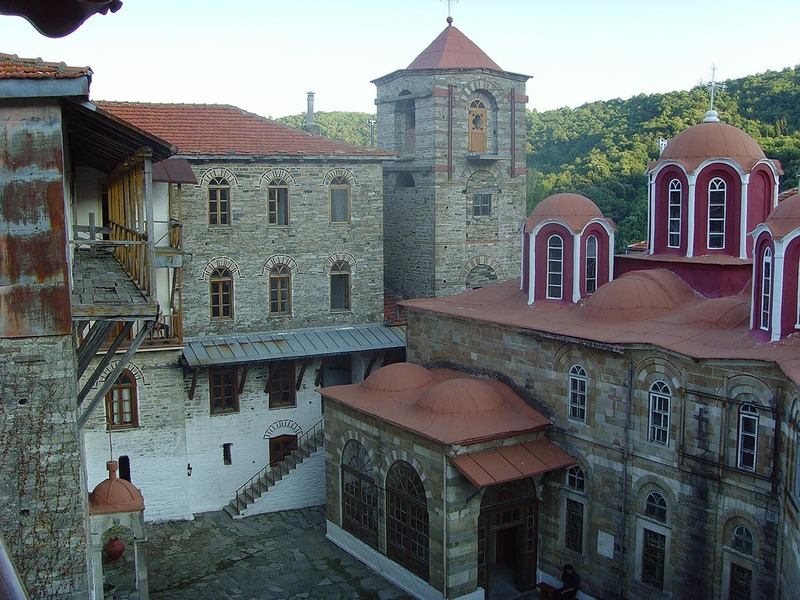 The first confirmed testimony for the existence of the Monastery dates back to the late 11th century and is found in a document of 1097 which mentions the abbot Ilarion Kastamoniti (possibly owner of the monastery). 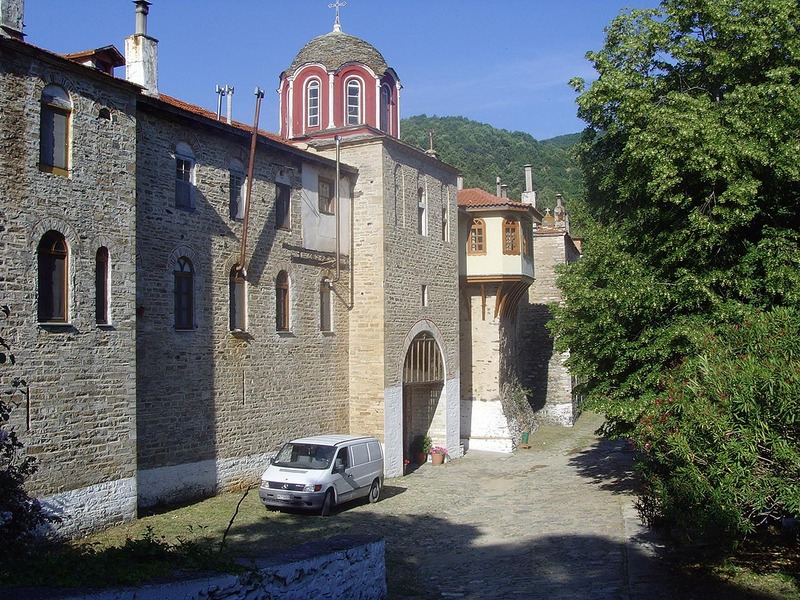 It is mentioned with the name Monastery of Kastamonitou in the golden seal of emperor Ioannis I Paleologos, in the golden seal of Manuel II Paleologos as well as in the third Document (1393). 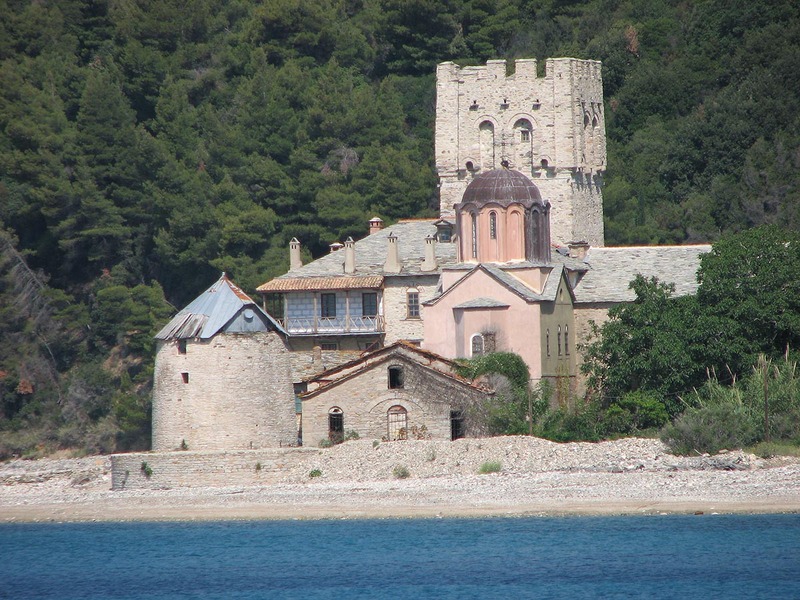 It is the 20th in hierarchy among the monasteries of Mount Athos. In 1288 after the damage it received from Catalan mercenaries, great economic assistance was offered by the emperor Andronikos II Paleologos. Great was also the financial aid of princess Anne of Philanthropinis and of Emperor Manuel II Paleologou and of the Serbian ruler Georgios Vrankovich. 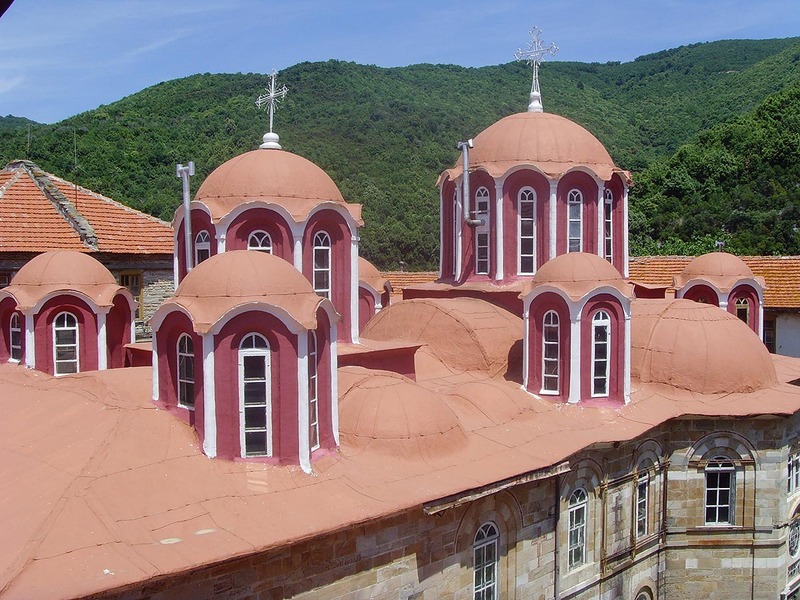 Serbian General Radic also donated substantial sums to the Monastery. After the 16th century the monastery was in economic malaise because again a fire destroyed the facilities and this situation seems to have continued until the end of the 18th century, when an new era of development began. In 1799 there was financial assistance when patriarch Neofytos turned it into a communal Monastery. In the next few years, new benefactors appeared such as Vasiliki of Ali Pasha. One of the precious gifts she offered was the Lectionary which is kept at the Prothesis. 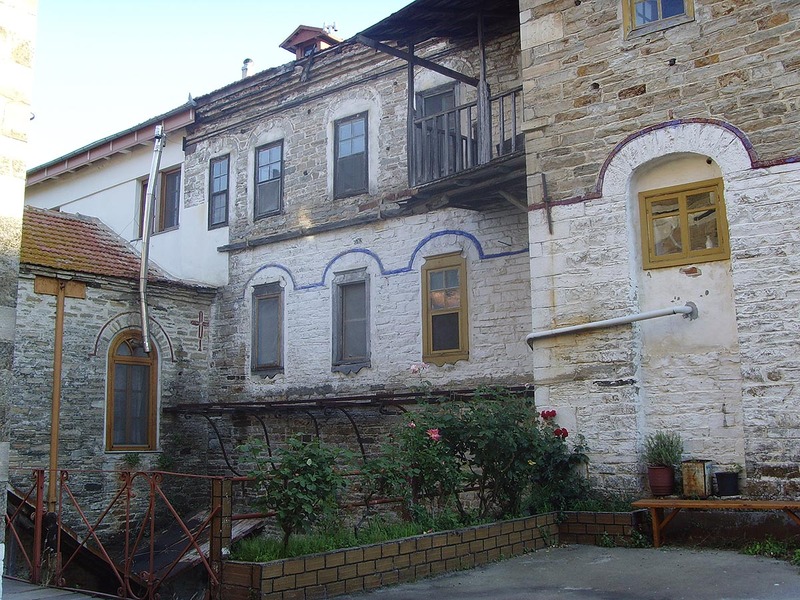 From 1835 the economic situation started to improve thanks to the initiatives of Simeon from Stagira. 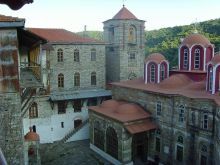 The monastery owns 4 chapels inside, 4 outside, 1 Seat and 1 Cell in Κaryes. 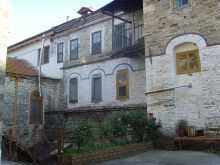 The Katholikon was built in 1860-1867 on the ruins of the old temple and it has not been painted. The Prothesis is without frescoes and it is located on the west wing. The library contains 110 manuscripts, 14 parchments, and over 1,000 incunables. In the sacristy there are official documents, golden and silver seals, a piece of the Holy Wood, wooden carved crosses, functional utensils, sacred relics and sacred canonicals. 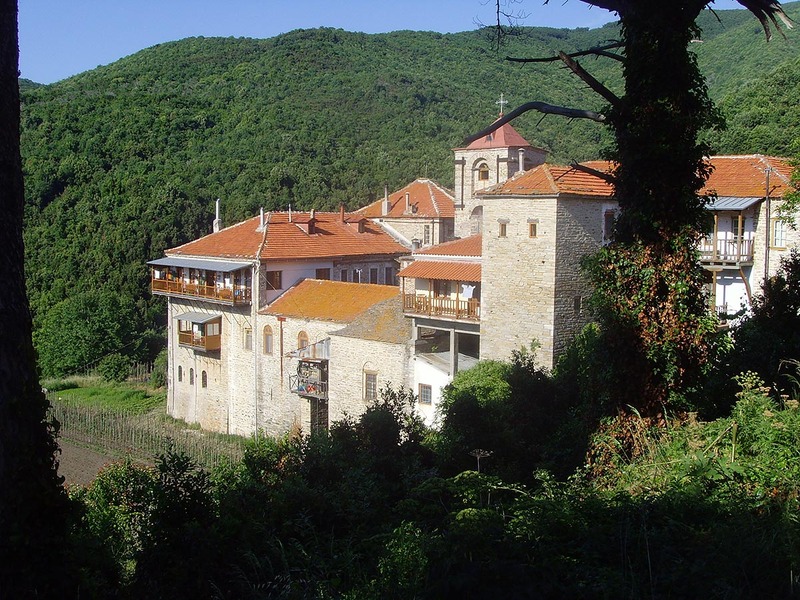 Among the pictures kept there, there are three miraculous pictures such as the picture of Agios Stefanos (8th century), the pictureof Panagia Antiphonitria and the picture of the Virgin Mary of Panagia Odigitria gift of princess Anna of Philanthropini. 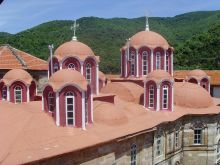 Guests should visit the Katholikon with the picture of the Virgin Mary the Odigitria and the frescoes in the chapel of Panagouda dating back to1670.